In September 2012, a salvage excavation was conducted in the eastern part of el-Bi‘na village in the Bet Ha-Kerem Valley (Permit No. A-6598; map ref. 226262/759565), after it was determined that mechanical equipment caused damage to a burial cave next to a residential building. The excavation, on behalf of the Israel Antiquities Authority, was conducted by E. Klein (field photography), with the assistance of A. Ganor, N. Distelfeld, G. Fitoussi, S. Bar-Tura and A. Rothstein. Additional aid was rendered by Y. Nagar (physical anthropology), A. Varnai-Ganor (glass restoration), I. Lidsky-Reznikov and C. Hersch (drawing of finds) and C. Amit (studio photography). N. Distelfeld identified the damage to the cave during an antiquities inspection. The burial cave, which was excavated and documented, had four loculi. Two clay sarcophagi were found; they contained human bones and several accompanying artifacts that date the burial to the third–fourth centuries CE. The cave is situated at an elevation of c. 280 m asl, on the western slope of the eastern hill, where a new neighborhood of el- Bi‘na was constructed. The cave was hewn along the interface between the chalk and marl bedrock of the Menuha Formation and the limestone of the Bi‘na Formation; ‘Ein Baiyada spring flows c. 200 m north of the cave. No archaeological remains are known near the cave, but it is located c. 400 m from the ancient nucleus of the village, which was inhabited from the Late Bronze Age to the Ottoman period (Stern 2007). An excavation conducted in the village during the British Mandate yielded a burial cave with several clay sarcophagi and a decorated lead sarcophagus (Avi-Yonah 1934:91; Rahmani 1999:88–89, No. 10). The cave is rectangular (Fig. 1) and was hewn along an east–west axis. Illicit work conducted nearby destroyed the cave’s façade, which faced west, and a section of the northern part of the cave next to the façade; consequently, the restoration of that part of the cave is incomplete and relies on the wall stumps that could be discerned on the floor near the opening. The cave was probably hewn in the front of a natural bedrock terrace, or was reached by way of a vertical shaft that descended from the surface to the cave’s entrance. The opening (width c. 0.7 m, height 1.45 m), having an arched ceiling, widened to c. 0.9 m at the entrance to the main burial chamber. A vertical groove (width 0.25 m, depth 0.2 m), which probably served as a track for a sealing stone, could be discerned in the southern doorjamb of the cave opening. Since the opposite doorjamb was not preserved, it is unclear whether it served a roll-stone that was rolled in the track across the opening or a stone that was inserted into the track from above, using a system of ropes, as in the Byzantine-period tombs discovered in the nearby Tefen region (Lederman and Aviam 1997:145). A rock-cut step descended from the opening to the burial chamber (length 4.65 m, max. width 3.3 m, height 1.8–1.9 m). Protruding bedrock and the negatives of quarrying remained in the cave’s floor on both sides of the entrance indicate that the cave was left incomplete (Fig. 2). Shelves or bedrock benches (width 0.25–0.35 m, height 0.4 m) were left beside to the southern and eastern walls and along part of the northern wall of the cave. Prior to the excavation, the floor of the cave was covered up to the height of the bench with fill consisting of small white gravel quarrying debris. Almost no artifacts were discovered in this layer, save for a body sherd and the rim of a Shikhin-type jar, which was in use during the second–third centuries CE (Fig. 3:1, 2; Adan-Bayewitz and Perlman 1990:165–168, Fig. 3:3). Four loculi with horizontal ceilings were cut in the eastern part of the southern and northern walls, at the same elevation as the upper part of the shelf (Fig. 4): Loculus 1 (length c. 1.6 m, width 0.6 m, height c. 1 m) and Loculus 2 (length c. 1.9 m, width 0.7 m, height c. 1 m) in the cave’s southern wall; and Loculus 3 (length 1.2 m, width 0.6 m, height c. 0.9 m) and Loculus 4 (length 0.8 m, width 0.5 m, height c. 0.9 m) in its northern wall. The dimensions of Loculi 3 and 4 were smaller than those of Loculi 1 and 2, and their interiors were only roughly hewn, possibly an indication that the quarrying of these niches was never completed. In Loculus 2, the only one in which artifacts were discovered, was a clay sarcophagus (length 1.9 m, width 0.5 m, height 0.3 m; Figs. 3:4; 5) covered with three large ceramic roof tiles and containing the bones of a man, 25–30 years of age. The upper part of a glass bottle was found between the sarcophagus and the wall of the loculus. At the entrance to the loculus lay a rectangular sealing stone (length 0.6 m, width 0.25 m, height 0.4 m). The openings to Loculi 1 and 2 were blocked by a clay sarcophagus identical in size to the one in Loculus 2 and like it covered with roof tiles; it was placed across the length of the burial chamber (Fig. 6). For most of its length, the sarcophagus lay on the fill in the burial chamber; it also rested partially on the southern shelf. The sarcophagus contained the bones of a male, 20–25 years of age, and the base of the glass bottle found in Loculus 2 (Fig. 3:3), evidence that the burial was disturbed in the past. The bottle was made of colorless glass with a greenish-bluish tinge. It had a globular body, a thin wall, concave base, cylindrical neck and everted rim. A bluish trail was wrapped around the upper part of the neck. Another trail was wrapped around the shoulder of the vessel, and several horizontal lines were delicately engraved above it. The bottle dates to the third–fourth centuries CE. 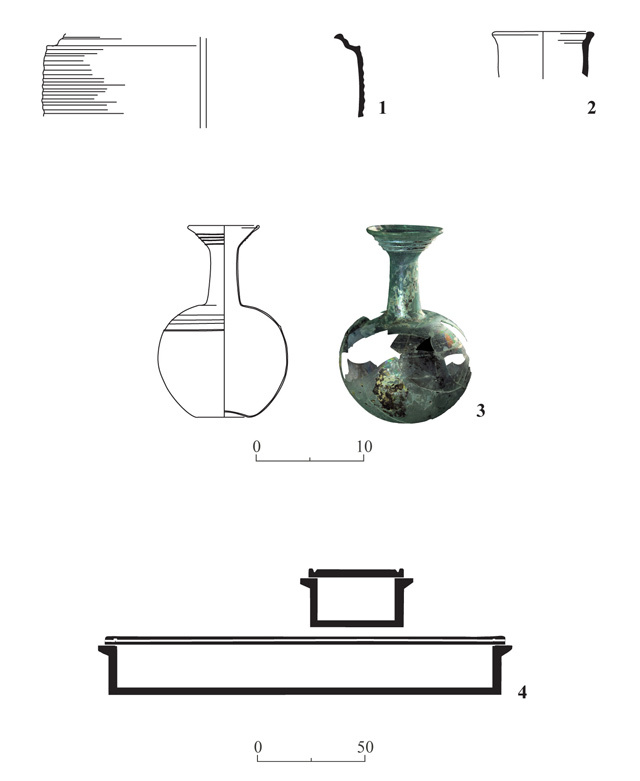 Similar bottles were discovered in burial caves from the Late Roman period at Hanita (Barag 1978:25–26, Fig. 13:53), Tell Shubeib, near Moshav Liman (Abu ‘Uqsa and Katsnelson 1999:176–178, Fig. 4:7) and at Horbat Bata, near Karmi’el (Porat 1997:83–85, Fig. 3:1). Two phases of use were discerned in the cave. During the first phase, the cave was used for quarrying building stones, as evidenced by the negatives of those stones and the quarry stones that were found on the floor of the chamber near the opening. It seems that the bedrock shelf should also be ascribed to this phase. In the second phase, possibly immediately following the quarrying of the cave, the burial chamber was filled with gravel (quarrying debris) to the elevation of the quarry stones and bedrock shelf. Judging by the jar fragments form the gravel fill, the latter was deposited in the cave during the second or third century CE at the earliest. At this phase, the cave was prepared for interments, and at least two clay sarcophagi were placed in it, each of which contained one individual. The original location of the sarcophagi is unclear because the cave was disturbed subsequent to the burials, as evidenced by the glass bottle. Both sarcophagi might have been placed in the burial chamber, but it is also possible that the sarcophagus that was found in the burial chamber was removed from Loculus 1. The use of clay sarcophagi was widespread in the Galilee during the Late Roman period, and they were discovered at numerous sites, from Tirat Ha-Karmel in the south to Hanita in the north (Aviam and Stern 1997). In the past, a petrographic analysis of clay sarcophagi and covering slabs (roof tiles) from the Galilee revealed that these were imported from Cyprus or southern Turkey, probably through the port of ‘Akko (Shapiro 1997). The sarcophagi and the glass bottle allow us to date the burial phase in the cave to the third–fourth centuries CE. Abu ‘Uqsa H. and Katsnelson N. 1999. Tombs of the Roman Period at Tell Shubeib. ‘Atiqot 37:175–179 (Hebrew; English summary, p. 179*). Adan-Bayewitz D. and Perlman I. 1990. The Local Trade of Sepphoris in the Roman Period. IEJ 40:153–172. Aviam M. and Stern E. 1997. Burial in Clay Sarcophagi in Galilee during the Roman Period. ‘Atiqot 33:151–162 (Hebrew; English summary, p. 19*). Lederman Z. and Aviam M. 1997. Rock-Cut Tombs from the Byzantine Period in the Tefen Region. ‘Atiqot 33:137–149 (Hebrew; English summary, pp. 18*–19*). Porat L. 1997. Quarry and Burial Caves at H. Kenes (Karmiel). ‘Atiqot 33:81–88 (Hebrew; English summary, p. 15*). Stern E. 2007. El-Bi‘na. HA-ESI 119. 1. The cave, plan and section. 2. The cave opening and the quarrying negatives in its floor, looking southwest. 3. Pottery, glass and a sarcophagus. 4. The cave upon completion of the excavation, looking east. The sealing stone of Loculus 2 is visible. 5. Loculus 2 and the sarcophagus inside it, looking south. 6. The sarcophagus in the main burial chamber, looking south.